The rules for making a Will in Australia are similar across each of the States and Territories. 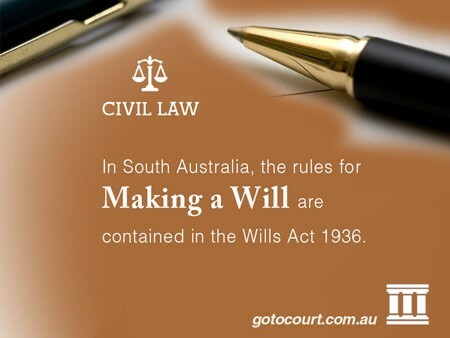 In South Australia, these rules are contained in the Wills Act 1936. You must be at least 18 years of age to make a Will. Minors (i.e. people under 18 years of age) can make a Will if they are, or have been, married. A minor who is going to get married can make a Will, but it will only take effect once the marriage actually occurs. Alternatively, a minor can make a Will with the leave of the South Australian Supreme Court, which will only be granted if the Supreme Court is satisfied that the minor understands what a Will is and its effect, and the proposed Will carries out the minor’s instructions. The Will must be in written form and signed by you (or by a person in your presence and at your direction). It must appear from the Will that you intended to give effect to it by signing it. You must sign the Will in the presence of at least two witnesses. Each witness must also attest and sign the Will in your presence. Your witnesses can also be beneficiaries under the Will, however this is not recommended as this may raise queries as to whether you signed under duress or were coerced. If one of your witnesses is, at the time the Will is signed, incompetent to be a witness at the time the Will was executed, your Will may be invalid. You have “testamentary capacity” to make a Will. This means you have the capacity to make a Will, which includes being able to communicate your intentions of who Will receive your property. If you do not have “testamentary capacity”, then another person can apply to the Supreme Court on your behalf requesting an order that a Will be made for you. The Supreme Court Will only make such an order if it is satisfied you would have made the Will yourself if you had testamentary capacity. What if my Will does not satisfy these requirements? If a Will does not satisfy each of the above requirements, it may not be valid. If you die without a valid Will, you die “intestate” and your assets will be distributed to your relatives based on a pre-determined formula in Part 3A of the Administration and Probate Act 1919. However, if the Supreme Court is satisfied that a document was intended by you to be your Will, then it may accept it as your Will even if the legal requirements are not satisfied. You can appoint a friend, a relative, or anybody else you think would act in your best wishes as your executor. You should consider a person’s age before appointing them as your executor. You may also want to appoint more than one executor, or appoint a substitute executor in your Will, in case one of your executors die. You can appoint the South Australian Public Trustee as the executor of your Will. However, the Public Trustee will charge fees to administer your estate. Can I choose who benefits under my Will? It is entirely up to you who is named as a beneficiary in your Will. However, under the Inheritance (Family Provision) Act 1972, in certain circumstances your relatives can apply for a family provision order if they believe that they have been left with inadequate provision under your Will. An executor must refrain from making any distributions to beneficiaries, pending the outcome of a family provision claim. If you get married in South Australia after making a Will, then that Will is revoked unless it was made in contemplation of the marriage. Getting a divorce will not revoke your Will, but it will revoke any dispositions to, or appointments of, your former spouse. If you die without having made a valid Will, then you will be treated as an “intestate” and your estate will be distributed amongst your surviving relatives. If you make a Will and it is not valid, you may be treated as an “intestate”. Therefore, it is recommended that you should generally have a lawyer prepare your Will for you to ensure that it meets the formal requirements of a Will. What if I have a Will from another State or Territory? South Australia recognises Wills made in other States and Territories, provided they satisfy the legal requirements for a Will in that State or Territory. If you own immovable property (e.g. land) located in another State or Territory, then the Will must comply with the requirements for that State or Territory to be admitted as a valid Will in South Australia.